So many different Indian foods are made with lentils. From kichidi (simple rice and lentils) to soups, flat breads and even some Maggie noodles (think Ramen noodles) are made from lentils. Beans and lentils are a primary source of protein for many vegetarians, and India is full of vegetarians. When I was a kid, I didn’t like lentils very much. I especially hated cooked mung beans. For some weird reason, I loved snacking on sprouted mung beans but wouldn’t touch them the second they were cooked. My mom used to try to get me to eat mung dal (soup) by calling it “French soup” and trying to convince me I would like it because I liked Western food. As an adult, lentils are more of a comfort food for me and I even like mung dal now. I know there is a lot of confusion on the difference between lentils, beans and dals. So let me try to clear some of it up. Lentils are legumes that are shaped like a lens (wide in the middle and narrowed at the ends). Beans on the other hand are larger. Mung beans are not lentils and used to belong to the species that we commonly call bean but have been reclassified and so are no longer technically beans. It’s confusing! The better word for all these little gems is pulse. A pulse is a dry legume that grows in a pod of one to 12 seeds. It includes beans, lentils, peas and other little seeds I commonly (but incorrectly) refer to as lentils or beans. 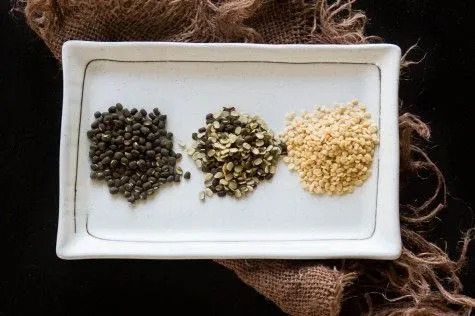 Indian pulses are usually available in three types: the whole pulse, the split pulse with the skins on, and the split pulse with the skins removed. Dal is often translated as “lentils” but actually refers to a split version of a number of lentils, peas, chickpeas (chana), kidney beans and so on. If a pulse is split into half, it is a dal. For example, split mung beans are mung dal. A stew or soup made with any kind of pulses, whole or split, is known as dal. If the whole pulse is cooked into a dry curry or stir fried simply with spices but not much liquid, it’s called kathor in Gujarati. Just remember, wet is dal, dry is kathor. Pulses are used to make a wide variety of food in Indian cuisine. Desserts are commonly made with pulses. Pulses are often ground into flour, such as besan (garbanzo bean flour). This flour is used to make a huge variety of foods such as vegetable pakora, khandvi, kadhi, sev, puda and so much more (the list of things you can cook with garbanzo bean flour is literally endless!). Pulses are also soaked and then ground into a paste (often with soaked rice) to make dishes like handvo, dosa and idlee. Adding pulses to your diet is a great way to eat healthier. They are so full of protein, fiber, iron and so many other nutrients. 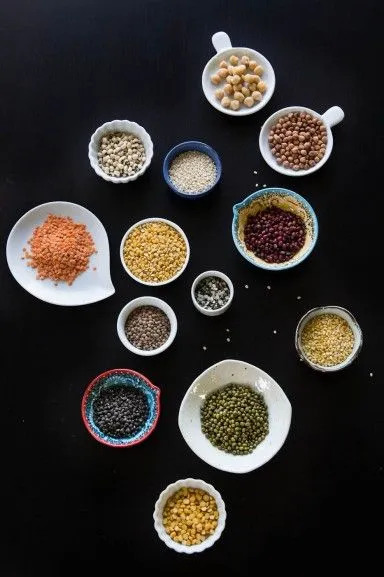 Here are some of the most commonly eaten dals, lentils and pulses in India (India is a huge country with a large variation in diet from place to place. This list is specific to what is most commonly eaten in Gujarati cuisine but also translates to many other parts of India). 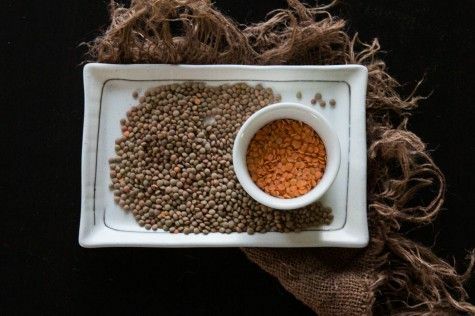 And if you are interested in adding more lentils to your diet, here is a great list of common non-Indian lentils by Oh My Veggies. Check it out! Mung beans (also known as green gram, Hindi: moong, Gujarati: mug), are little green seeds that are yellow inside. They have been eaten by Indians for thousands of years. Mung beans are used for both sweet and savory dishes in Indian cooking. They are eaten whole, sprouted, split with the skins on and split with the skins removed. In fact, mung dal (split with the skins removed) is one of the most commonly used lentils in my kitchen. 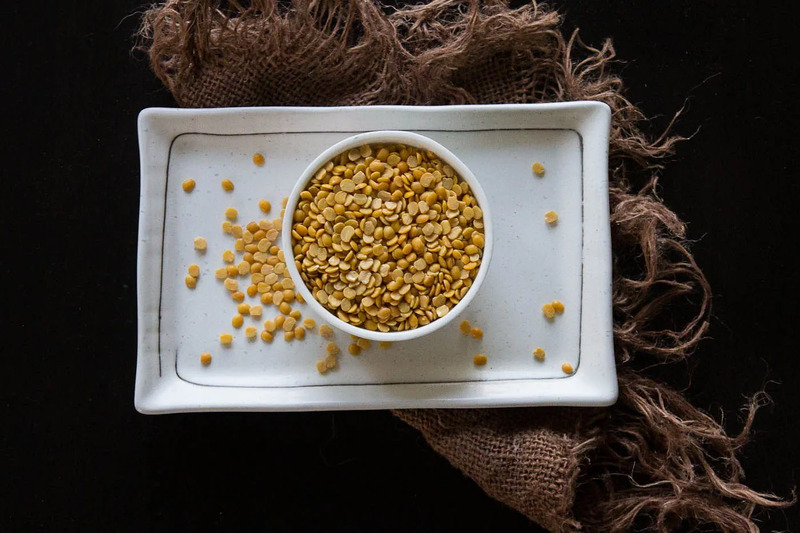 Mung beans with their skins on have a flavor reminiscent of green leafy vegetables but the mung dal with the skins removed has a mild sweet flavor and is often used for desserts as well as making kichidi and mung dal. 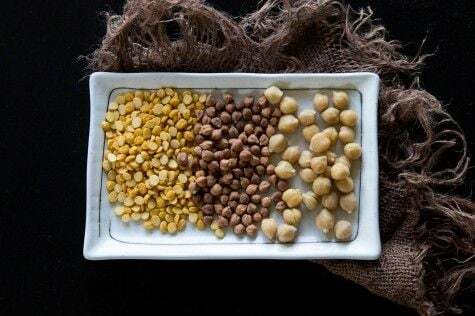 Chickpea (Channa) – Split Channa, Desi Chana and Kabuli Channa. Kabuli Channa is the familiar Garbanzo bean common in the Mediterranean diet. Garbanzo Beans (also known as chickpea, Bengal gram, Hindi: channa, Gujarati: channa). Garbanzo beans are found in two forms, the smaller dark skinned beans known as desi channa and the larger white skinned beans known as Kabuli channa. Garbanzo beans are commonly eaten in India in as whole beans, as split lentils and a multitude of dishes are also made with garbanzo bean flour (known as besan). Channa Masala is the most popular dish made with Kabuli channa. Channa are slightly nutty in taste. The brown ones are earthier in flavor and tend have a drier texture. Masoor (also known as red lentil, Hindi: masoor, Gujarati: masoor) is a brown skinned lentil that is orange on the inside. Masoor dal has a pleasant earthy flavor and is very common in Northern India. It is commonly used to make dal, soups and stews. Pigeon Pea (also known as tropical green pea, Hindi: toor, Gujarati: tuver), is a beige lentil with a yellow interior. This is the most important pulse in a Gujarati household. The fresh peas are highly prized and used for curries and stuffing in spicy handpies. They have a delicious nutty flavor that is very distinctive. The dried and split peas are a staple in everyday cooking as well. The famous “Gujarati Dal” is made with this pea where the balance between spicy, sweet and sour is most important. Black-eyed pea (also known as cow pea, Hindi: lobia, Gujarati: chora). 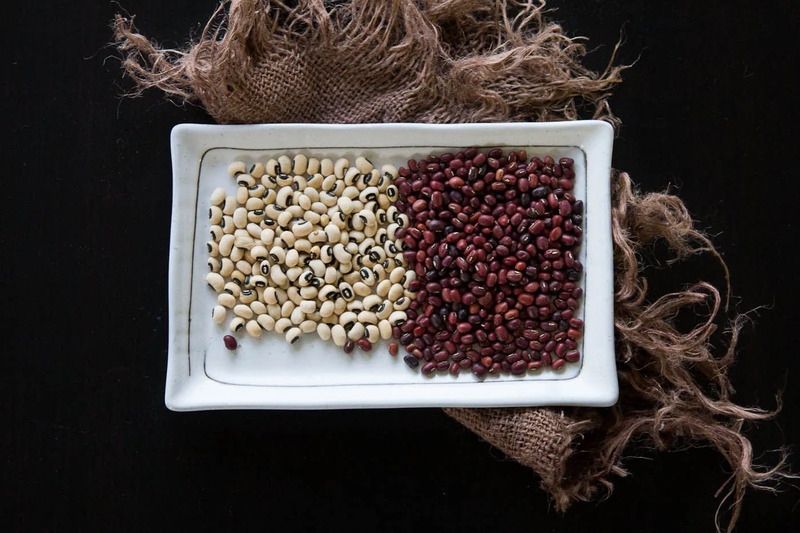 Black-eyed peas have a distinctive flavor and are an all around pulse in Indian cuisine. They’re used to make curries, dals, papads and fritters. Before you cook the pulses, sift through them to take out any pebbles or debris. Then rinse them a few times. Pulses taste best when they are cooked slowly. When cooking pulses on the stove top, bring to a boil and lower heat to medium low and let simmer. Start counting the cooking time once the pot has come to a boil and not before. In the case of kidney beans, boil for 30 minutes before lowering heat to simmer. If your pulses are old, they can take double the time to cook. If they haven’t softened in the time indicated, don’t worry. Just cook until soft. Make sure to add more water as needed. When cooking pulses, hold off adding salt or acids (such as lemon or vinegar) until the end, or the they will not soften. Water: If you are cooking on the stovetop or slow cooker, use about 3 to 4 times the water. In the instant pot or pressure cooker, two times the water will do. Always keep an eye on the stove and add more water if it starts to look dry. Indian pressure cookers are a little different from the ones available in the West. They usually release steam regularly in what is referred to as “whistles.” These whistles are counted to determine cook time. They are not always accurate and can vary from cooker to cooker. So use these whistle counts as a guide and figure out what works best for your cooker. Soaking: In the cases where soaking is optional, if you soak the pulses, it will reduce the cooking time. The cooking time I’ve mentioned is for unsoaked pulses where soaking is optional and for soaked pulses where soaking is recommended prior to cooking. 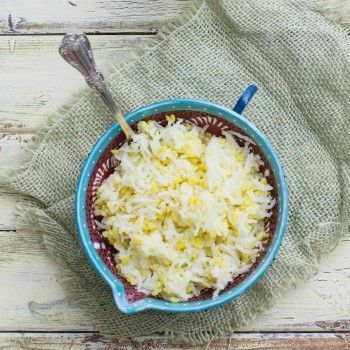 Slow cookers can be a great, convenient way to prepare pulses, just throw everything in in the morning and when you get home from work your food is ready. But some beans, e.g. kidney beans, are toxic until they are boiled (for at least 30 minutes), and slow cookers can actually make them more toxic. If you want to use the slow cooker on these beans, boil them for 30 minutes before adding them to the mixture, or use canned beans which are already boiled. Comments on "A Guide to Indian Dal, Lentils, Beans, and Pulses"
Thanks Elizabeth! :) Glad it's helpful! Fantastic post!! People often ask me the difference between mung daal and mung bean..I will refer them to this post! I could KISS you for this post!! This is AWESOME!! Just what I've been looking for. This is an incredible resource. I learned so much about the different kinds of "pulse" and the differences between them. Working with beans and lentils has been a little daunting for me in the past so I am bookmarking this post for future reference. Thank you so much! Thanks for the in-depth guide. I just bookmarked it! I am most familiar with French lentils, but I am open to exploring the ones listed above. So many possibilities :)! Wow very informative Puja! One year in draft mode is a super long time! Also, can't believe red beans are listed as toxic (though I usually don't slow cook my beans at this time). I'll make sure to come here when I need a bean guide! One of the coolest photos I've seen, hands down. Very reminiscent of a constellation. This was really helpful. I've been searching for a guide like this for a long while so thank you! One thing, though: Is a "gram" the same thing as a pulse? Thanks Liz. I'm so excited that so many people are finding this post helpful. The term gram is used for several Indian pulses like mung, garbanzo and urad. As far as I can tell it's just a reference to pulses. Hope this helps! Gram is a pulse generally called chana. Split- it's chana dal n its flour is gram flour or chana flour or BESAN. This is very helpful for my new business to understand different between pulses and lentils. Thank You very much. Pooja thomas very good help me give a list of of all kathor. A heard there are 28 kathor are available. Thanks Hanifa. Glad it's helpful! Just found your website recently and I have to say "What a great resource and information! I really want to expand my palate in Indian cuisine and this chart is helpful for those of use unfamiliar with Indian cooking. I looking forward making your recipes. Thanks..
Well my search for protein rich diet brings me here. Awesome stuff! Me being an Indian and eating all these for years was still confused. Thank you! Your post contains in a precise way — exactly what I was looking for. And I couldn't figure out what "whistles" meant since I have a pressure cooker made in USA! I still don’t know what “whistles” refers to. A whistle is part of Pressure Cooker which produce sound when pressure in cooker is more than it can withstand. You have Pressure Cooker made in USA or made at Moon doesn't matter. It will have a whistle. Hi, I think you can help me out, I want to know the exact Gujarati Name of White Beans? I am confused in Vaal or Valol. I also always used to get confused between all pulses and dals. Now I know the difference between all. Which dals are toxic? Can you name them. Very nice article. I just made a dal for the first time in the slow cooker with mung beans. It was delicious! Thanks for all the tips! I was ready to throw out the whole urad dahl as a failed product. I treated them like mung beans. Thank you for your clarity and comprehensive review. Gr8 information, finally I know clearly about Garbanzo Beans and its flour :):) Thanks alot ..!!! Extremely useful. I just moved to India and was amazed to see so many different types of beans and lentils. Now I know what they are. Cannot wait to try them all. Thanks. Thanks for clearing that all up letting me know I eventually got it right. I'm new to Indian cooking and cooking with pulses and have been piecing together little things for over a year and still wasn't 100% sure about things. Hi Jodie - Sorry for the delayed response! Mung beans are the whole bean. 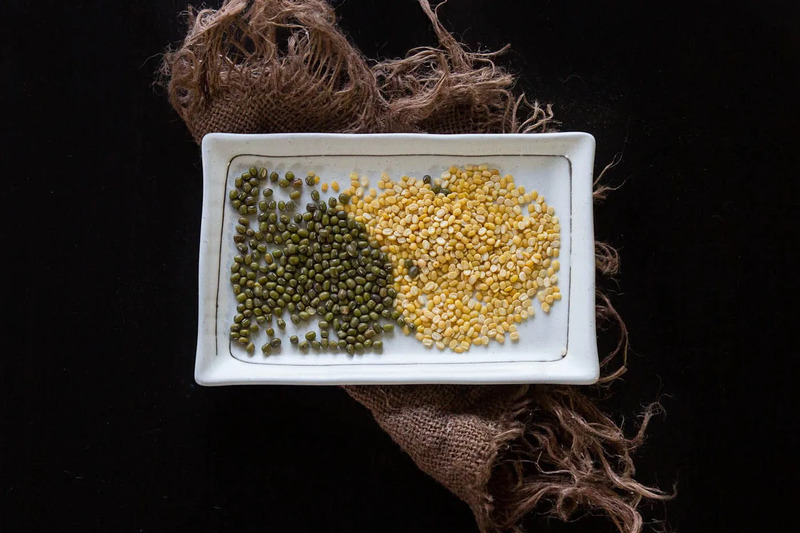 Moong dal is the same bean that has been split. Hope this helps! This is absolutely great! I'm translating an Indian cookbook and this is a lifesaver! Thank you! Thanks Laura! Happy to be of help! Hello, I'm on a low oxalate diet and can have legumes but not lentils... do any daals fall into the legume category? Very useful post. I was thinking of writing one on pulses and searched to see if anyone had already done it. So, saved me lots of research and effort. Thanks. Thanks Puja, had been the look out for right combination of lentils to be added to my diet and your writeup opens up the possibility of keeping it Indian and still have the trim low glycaemic meals. This is great. Do you think you could do a similar guide on Indian chilis for cooking. My kids don't like too much heat but I want to add flavor where I can. Are these grains/dals available in USA? Yes , Sumit I bought all of these in the US. Look for am Indian grocery store/ market. You can all but them online. Now that is indeed an informative blog! This is the most helpful version. I was so confused as to what was split/non-split/legume/lentil. I knew most of this but i had no idea lal chawli was azuki. Every time I made a recipe, i substituted, thanks for the list. Thanks very good information on various dals. If you add proten, minerals and vitamin contents I hope it is better. Similarly also mention vitamins and minerals distroid while cooking and how to retain them. Thank you for this! My husband is allergic to lentils, peas, and kidney beans, but not to chick peas or mung beans. I was pretty sure that Urad Dal wasn't a "true lentil," but your list clarifies things further; i.e., that "lentil" is a loose translation of "dal" and refers to the lens-like shape and NOT necessarily the species. If you have room on a later chart, the Latin names of the various pulses might prove quite helpful for those trying to avoid particular species. Thanks again from BC, Canada, where indian pulses and spices are very readily available. 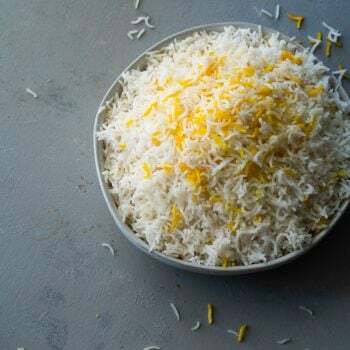 HI , My name is Karuna, m newly married and my mother in law is great cook but learning from her its difficult as every indian household has different ways of cooking. So I m new to cooking and specially Dal is difficult.. firstly to identify which dal is what called in gujrati is so different.. your articles is actually very helpful for new bahu in kitchen like me.. Thanks alot for you post. This is amazing..I asked my husband to bring Moong Daal and her got Toor, which was something very new for me, so I searched and after disappointed from Wikipedia, found this little but very comprehensive information...Good work!! Will visit your page over and over, have added in my fav. Tanks for giving valuable information's on cooking. I have a doughty that some times you mention Lentils as beans or pulses, some times Lentils as Masoor dal, if Masoor is Lentils then don't use the word Lentils at all. If Lentils is different, please give photograph and explain about Lentils. Your website about beans/legumes, dal, etc., is great. There is one big problem, I want to live in India now that I am retired, but I find it too expensive to travel there from the Philippines, originally from the USA. I like lentils, mung and all other legumes. Your fotografs are great and make a person hungry. I was looking to find info on how Pigeon Peas the are green turn to Yellow when dried. It led me to this article. Very informative, but yet it doesn't answer my question. Please reply if anyone knows. Although we are traders of dals and pulses, but this was a real eye opener for us as-well. Thanks Puja Thomas Patel for the great article. Thank you for your thorough explanation of the dals! I've always wondered about the cooking times. Would it be possible for you to add the stove-top cooking times since so few of us in the U.S. have pressure cookers (us non-Indians anyways). Hi Cheryl! I'm glad this is helpful. The stove top cook time is actually up. That's what I mean by cook time. Thank you! So helpful, as an Indiaphile I needed to know specifics! All are so delicious! Thank you so much for this post, it has really helped. Hey Puja! I find this quite informative. Thanks for sharing. In the article, you have mentioned "Pulses are also soaked and then ground into a paste (often with soaked rice) to make dishes like dosa and idlee". I assume that you are referring to wet grinding of the soaked pulses and soaked rice together to make a paste. Is it possible to create the same paste by using ground pulses' powder and ground rice powder? very nice !! helped me in my project work....thanx ! great info.. thanks for the post. I just found your site and wanted to thank you for such an enlightening post. I was looking for a recipe on rava upma and just happened along your blog. Looking forward to exploring it more. Thanks! I came here trying to figure out the Indian name for what are marketed in America as "yellow lentils." I think it's tuver dal? If true, it might be worth a reference in this post; I can't easily find another place that does the translation. The comment on age of the dried pulses and cooking time is critical. For western cooks that may make Indian food as well as non-Indian food, using these items may result in half a package of an item to sit in a larder for months after purchase. So the comment on cooking times and the need for soaking is probably most relevant for open packages. It does raise a couple of questions about, "how old is old?" for items that are described both in terms of storage in warehouses and retail stores as well as our larder. I'm now somewhat convinced that most dried items are older than we think and take longer than we think as well. What is channa dhal? Does it need soaking overnight? This is a great article, very helpful, thank you. I really appreciate the time and research taken to make this informative website. Being newly diagnosed with type II diabetes, I am sure this will help me to improve my diet. Thanks so much for posting this. You answered so many of my questions. Whenever I go to an Indian or Oriental market I'm like a kid in a toy store. Everything looks so wonderful. I buy buy buy and get home and don't know half of what I have or what to do with it. This article helps a lot. I would love to see that table with images of the dals next to them so i could print and keep in my kitchen. Thank you for this eye opening read. Great resource! You mention that some beans are toxic if not cooked, but I don’t see a list of those or a reference to toxicity in each description or in the cooking chart. 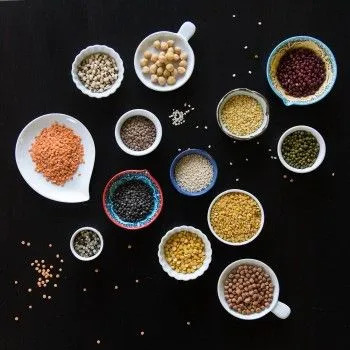 Please add this detail to make this the only page a person needs to visit for complete information on lentils, beans, and pulses. Thank you! Just starting with Indian cooking and this was best explanation I found on the dals. Thanks so much! A recipe I'm looking at asks for 'Thur Dahl' - I"m confused and so is Google. :-) Can you help? Is it possible the book has spelt it wrong and it should say 'Toor Dahl' or what exactly am I looking for? Thank you so much. Hi Isabel! That sounds like it would be toor dal. There is a huge variation in the English spellings of words that are originally in Hindi (or any of the other Indian languages) because the Indian languages are written phonetically. If you can tell me what the recipe is, I can further confirm what lentil it would traditionally call for. Thanks so much for this article. I cook Indian dishes all the time and have slowly worked some of this out for myself, but it is great to have all the information summarised in one place. The next recipe I want to try is a South Indian peanut podi, and the recipe calls for gram putani. I am having a lot of trouble finding our if this is a specific pulse or... What? Can you help? This is a FANTASTIC post! I'm getting deeper and deeper into Ayurveda, and so into a lot of marvelous Indian foods, spices, and ways of preparing food. The chart is one of the best I've ever come across online. Would you happen to have comparable soaking and cooking times for Pinto beans and black beans?